Initiated in 1992, the Hall of Distinction recognizes and honors those alumni who have demonstrated distinguished professional accomplishments, outstanding character and commitment to community service. This recognition serves to encourage exemplary achievements by current students and others. 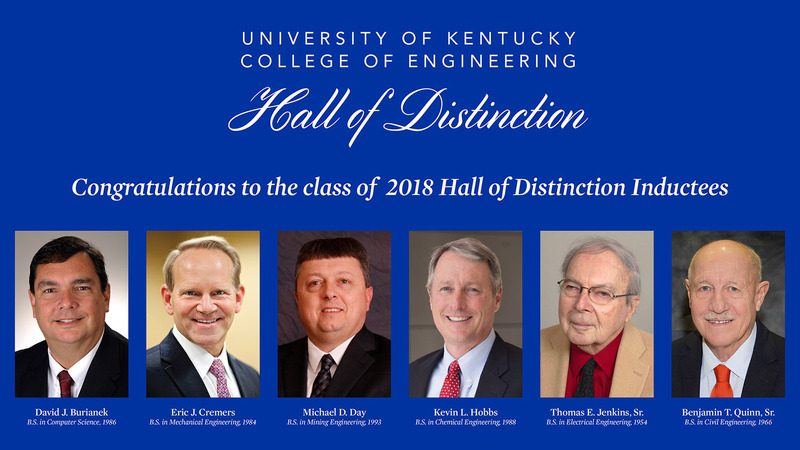 It is a symbol of the respect and admiration held by the University of Kentucky College of Engineering for these esteemed individuals. In 1988, recently graduated Kevin Hobbs began his 30-year career with Exxon as a process design engineer at its Baytown Refinery. Today, he is midstream director of ExxonMobil Fuels and Lubricants Company, where he leads about 8,000 employees and contractors operating in nearly 30 countries around the world. Hobbs’ management career began in 1997, and in 2005, he moved to ExxonMobil Corporate headquarters in Irving, Texas, as a senior advisor and investor relations advisor for the Downstream ExxonMobil business. In 2007, he became the refinery manager for ExxonMobil’s Fawley Refinery in the southwest of England. Upon returning to the U.S. in 2010, Hobbs became global logistic optimization manager for ExxonMobil Refining and Supply. He was promoted to his current position in 2013. Ben Quinn is CEO of American Engineers Inc., a company he founded in 1983. Throughout his 50-year career, Quinn’s goal has been to improve transportation in Kentucky and the Southeast. As CEO, Quinn is involved with strategic growth and financial affairs pertaining to the business. AEI has four offices, 42 registered engineers and over 125 employees with offices in Glasgow, Kentucky; Louisville, Kentucky; Owensboro, Kentucky; and Kennesaw, Georgia. In addition to growing AEI, Quinn has had many opportunities to be partner, owner and founder of several other business entities. These include commercial and residential development as well as a solar farm in California that serves San Diego State University. He is also sole owner of AEI Marketing, Inc., a company serving the marketing world.